Despite the increasing size of hard drives from manufacturers, there are still many users who have the problem of insufficient disk space. This might be due to too many downloads having taken place and the storage is flooded with a lot of rubbish or unnecessary files. Keeping too many unnecessary files not only fill up your hard drive space, it will also affect your computer performance. Periodical disk cleanup exercise will be good to clear away the junk files and optimize the computer’s performance. Wise Disk Cleaner is a handy and user-friendly disk cleaner that has been developed to help busy users to do scheduled disk cleaning. Once the application is installed, users will be prompted with a cleaning wizard which will guide users through the disk cleaning process. Besides those preset folders, users are also given the option to select files to be deleted based on the files’ extension. The scanning process is pretty fast. Once it is completed, users will be informed of the amount of space that can be cleared. Users can choose to proceed with thorough or complete deletion. Alternately, if users worry some of the files are important files, for security reasons, users can choose to instruct the cleaner utility to remove the files to the Recycle Bin first so that these files can be recovered if required. Users who need the cleaner to tidy up their hard drive can download Wise Disk Cleaner 4 via the direct link here (portable version via the link here). Of course there is another Wise Disk Cleaner Pro Version for those who are willing to pay an additional $19.95 for more features such as export entries to MS Excel, more optimization tool, etc. 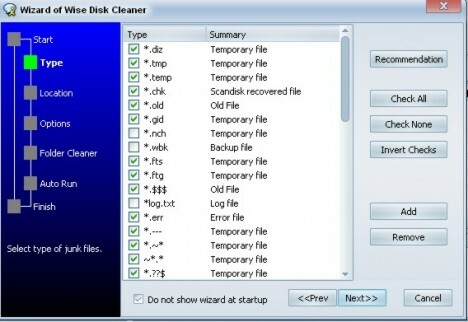 Wise Disk Cleaner Pro Version will be useful for the tech-savvy computer users. For other users, the free Wise Disk Cleaner 4 is sufficient for general use. Wise Disk Cleaner 4 supports all Windows OS including Windows NT, Windows 98, Windows 2000, Windows Me, Windows XP, Windows Vista, Windows Server 2003, Windows Server 2008, and Windows 7.